© Copyright 2018 The Associated Press. All rights reserved. Hungary's Prime Minister Viktor Orban at the European Parliament in Strasbourg, eastern France, Sept.11, 2018. 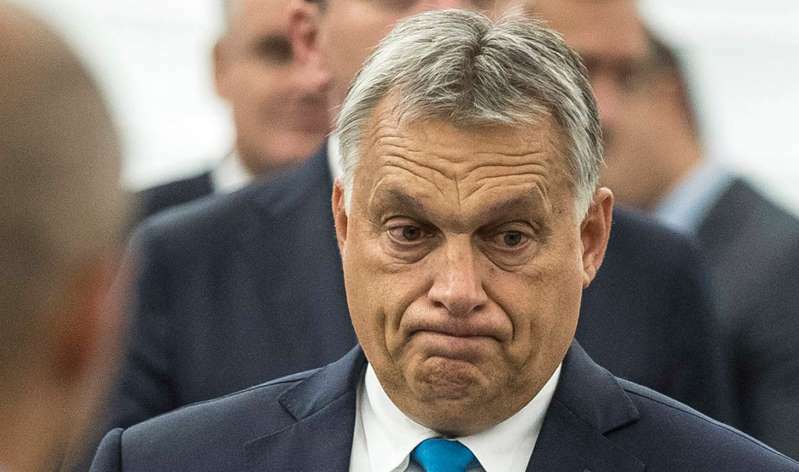 Using unprecedented disciplinary action, the European Parliament voted Wednesday to sanction Hungary, saying the country poses a “systemic threat” to democracy and the rule of law. Hungarian Prime Minister Viktor Orban’s government has been accused of breaching the EU’s core values in areas of migration, rule of law, and the media – which he denies. It was the first move of its kind in the EU against a member state, garnering two-thirds of the votes. If approved by national leaders, Hungary is set to face punitive measures. The ultimate sanction, the suspension of Hungary’s voting rights in the EU, is unlikely as Poland is set to veto that move. Dutch MEP Judith Sargentini led the process and received a standing ovation after the result was announced. The Hungarian foreign minister, Péter Szijjártó, called the vote “petty revenge” against his country’s tough anti-migration policies. The vote involved “massive fraud”, Szijjártó claimed, since abstentions weren’t counted in the final tally, which made it easier to reach the needed majority. On Tuesday, Orban said his country was being targeted for choosing not to be “a country of migrants” as he dismissed charges of corruption.